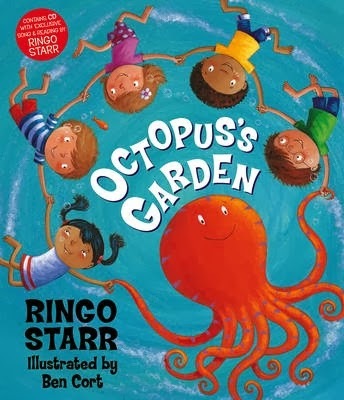 From the multi-talented Beatles’ drummer Ringo Starr, comes the song Octopus’s Garden played out in pictures against pages of underwater scenes. The illustrations by Ben Cort with their stunning colours will remain memorable with their dominating blue shades throughout the book. The text is positioned in various ways upon the pages. Words circle the children as they dance with the octopus below the sea, and other verse demands the book be turned lengthways to get full benefit of the picture as well as the text. There’s non-stop movement and joy as play takes place in the magical world under the sea. The children dress the octopus in jewels and crowns found in a treasure chest and discover ancient ruins. The scenes with the coral beds are magnificent. It’s as if I’m in a glass bottomed boat floating above watching all this happen below. There is a CD with the song included which can be played for a sing-along with the reading, or to be enjoyed any other way. This gorgeous production will bewitch young readers as it’s so alive and full of fun.